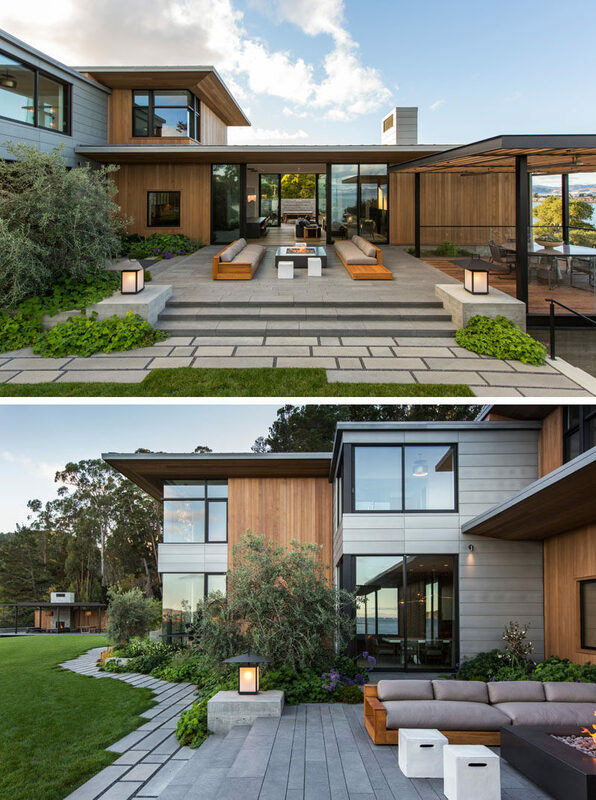 Walker Warner Architects have designed a new house on the Tiburon Peninsula in California, that has expansive views of San Francisco Bay. A bold red pivoting front door welcomes you to the home, and once inside, there’s an entryway that provides access to two separate sets of stairs. Heading downstairs, a stone wall runs alongside the stairs, while at the bottom of the stairs, there’s a decorative screen. Behind the decorative screen is the dining room. Large floor-to-ceiling windows allow plenty of natural light to fill the room. In the living room, large sliding glass doors open to an outdoor lounge to create an indoor / outdoor living experience. The outdoor lounge also has a firepit and a outdoor dining area sits underneath a pergola. 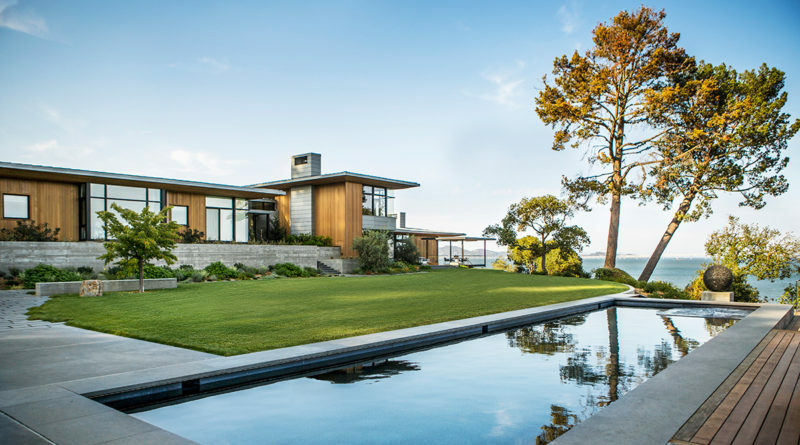 The architects used Aegean limestone, western red cedar, zinc and board-formed concrete, to create a modern home that would compliment its surroundings. Following the landscaped path from the outdoor lounge, you are led down to the swimming pool and cabana. The cabana is home to another outdoor lounge with a fireplace and another outdoor dining area. Back inside and in the kitchen, there’s a large stone island with seating and a wood base. The home also has a secondary living room. Similar to the dining room, it too has large windows to take advantage of the view, however it also has a fireplace with a metal surround. 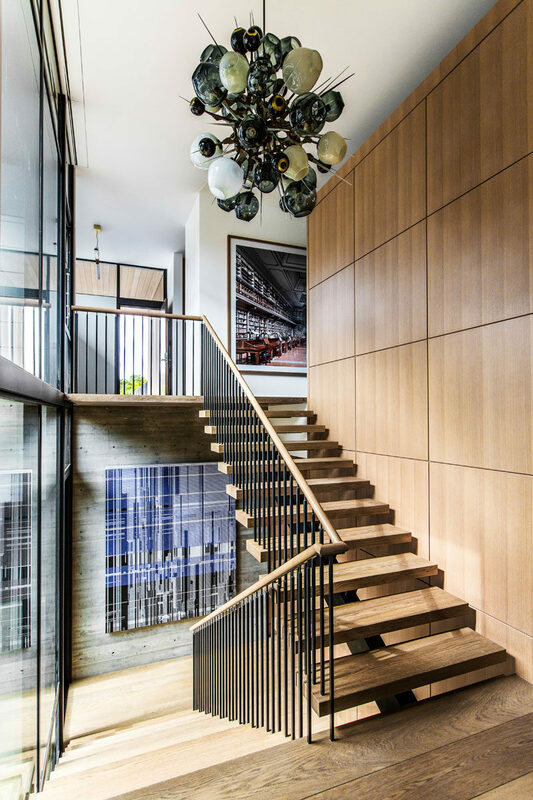 Wood and steel stairs lead up to the upper floor of the house. 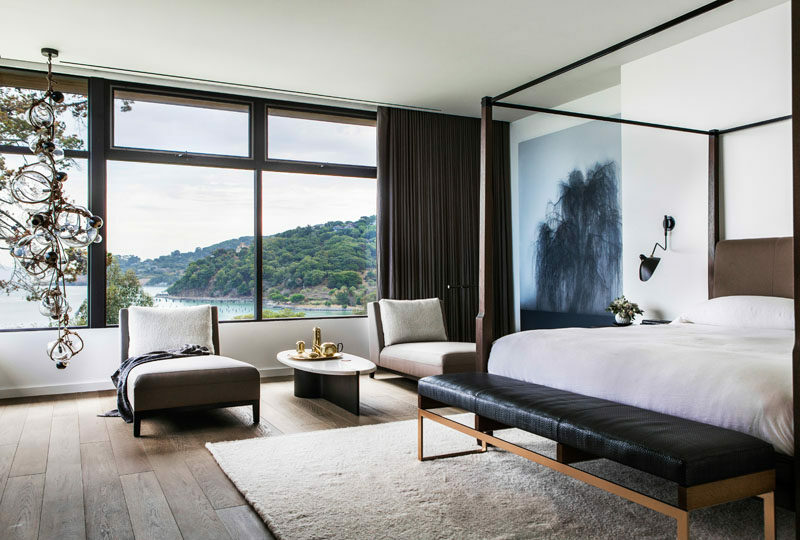 The master bedroom has a lounge area and water views. 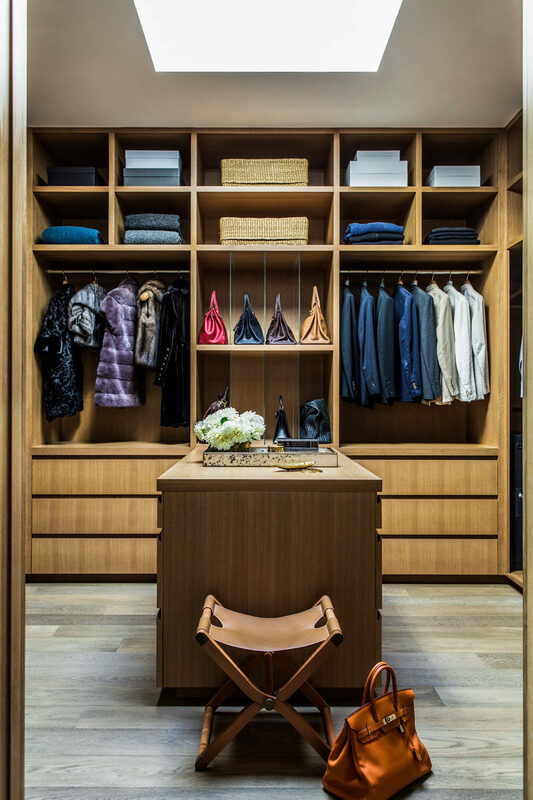 There’s also a walk-in closet with a skylight, that’s filled with plenty of open shelving, cabinets and an accessory island. 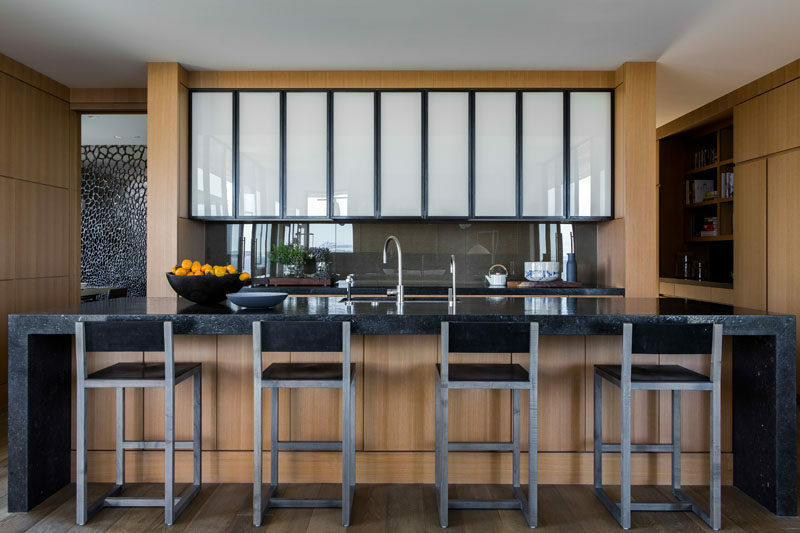 In the bathroom, two black-framed rectangular mirrors hang above a dual sink vanity, while sliding wood shutters can cover the windows for privacy when needed. 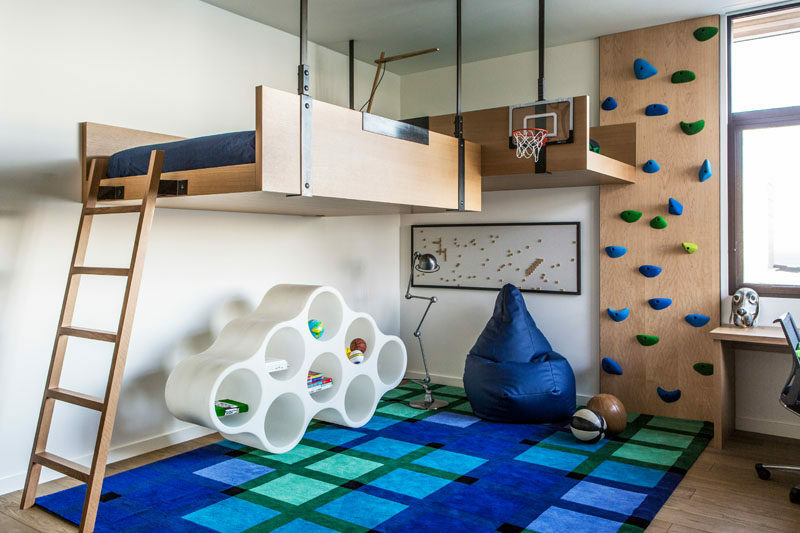 In the kids bedroom, there’s two beds that are mounted to the wall and hang from the ceiling. 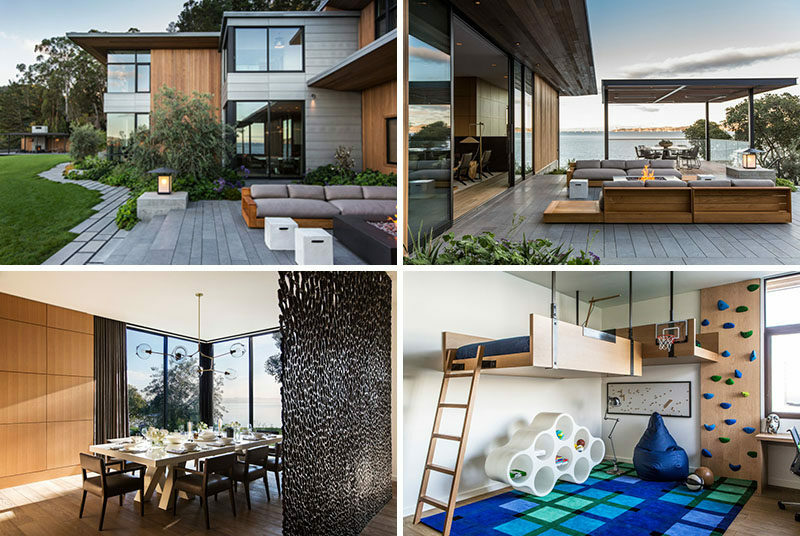 To reach the beds, there’s a ladder or a rock climbing wall. 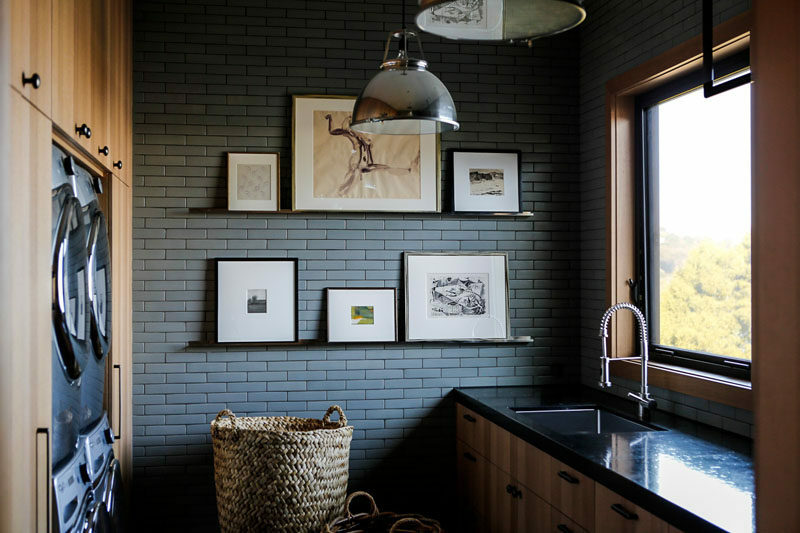 In the laundry room, wood cabinets surround the washer and dryer, while grey tile becomes a backdrop for some shelving that displays art.